Venue8600 provides a perfect environment for a variety of meetings and social events and we would love to work with you. With great flexibility and 29 room combinations, we offer space for anything from board meetings, art auctions and award ceremonies to sales launches, town halls and seminars. Wedding receptions, networking events, mixers or birthday celebrations easily flow from our café/lounge to the patio, to our lovely rooms and back. Have a new idea? We’d love to hear about it. 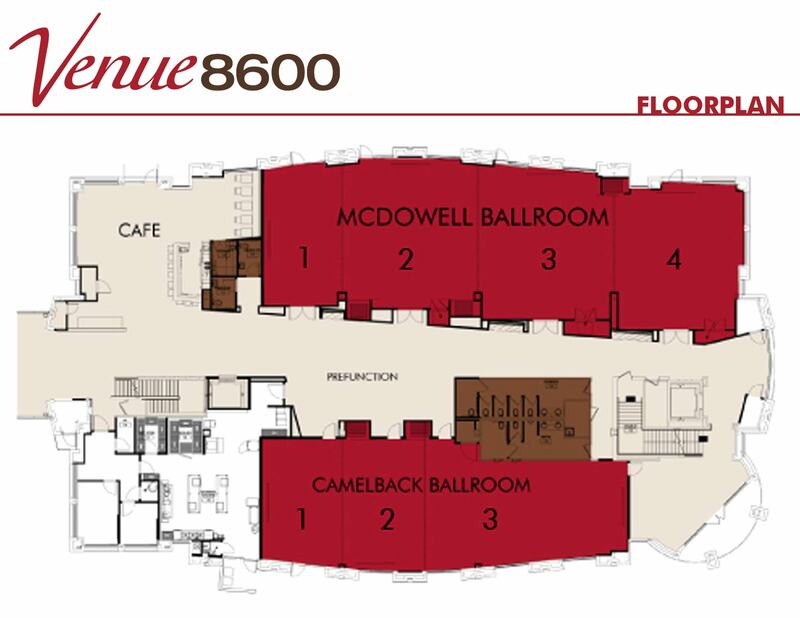 What type of events and meetings can be held at Venue8600? Venue8600 provides a perfect environment for a variety of meetings and social events and we would love to work with you! With great flexibility and 29 room combinations, we offer space for anything from board meetings, art auctions and award ceremonies to sales launches, town halls and seminars. Wedding receptions, networking events, mixers or birthday parties easily flow from our café/lounge into the patio, to our lovely rooms and back. Have a new idea? We’d love to hear about it. Can we bring in our own food and beverages or our own caterer? We do not allow food or beverages to be brought into the facility. Our wonderful and exclusive on-site caterer, Café Pranzo, provides food and beverages for your meeting or event needs. Working with your budget, they are happy to provide customized or sample menus to choose from to assist in making the process easy for you. They also handle all of your bar or mixer needs. How many points of entry or exit are there at Venue8600? There are nine points of entry or exit from our building. We love your space. What is your booking process? We are all about simplicity at Venue8600. Once availability is confirmed and you are ready to move forward, we send out a simple industry-standard contract and require a 50 percent deposit to guarantee the space. Final payment is required 30 days prior to your event. Let’s talk dollars. How much are your room fees? We offer a three-tier pricing structure based on 2, 2 to 4 and 4 to 8+ hour rates for our ballrooms and 29 combinable rooms. Because of that mix, it is difficult to quote rates without learning more about your needs. If you know your meeting or event requirements, please click below and we can provide a price quote and check availability if you also know your date. In general, pricing ranges from $215 to $5,500 plus tax and services fees, depending on your time frame and needs specific to your room setup. From comfortable tables and seating to a beautiful environment, we promise to provide a seamless and turnkey experience. How many restrooms are there in Venue8600? We have six restrooms with multiple stalls in four of them. We offer 225 complimentary and easy access parking spaces; valet services are also available. Need bus transportation for your group? We’ve got you covered with great referral partners for your transportation needs. Are there hotels close to Venue8600? Yes! If you need hotel information, we are happy to share these partnerships, locations and contacts with you. We typically do not accept shipments prior to meetings, however, we always try to accommodate small needs if necessary. Storage is detailed in our contract. Please ask our Director of Sales or Operations Manager prior to shipping any items. Anything we missed? Don’t be Shy. Get in Touch. We love to share our details. Café Pranzo is our onsite eatery open to our guests and to the public for breakfast and lunch on weekdays from 8 a.m. to 2 p.m. It’s a great spot with a cool vibe, free Wi-Fi and music. Come on over and meet a client, do a bit of work or just chill and enjoy our awesome atmosphere.